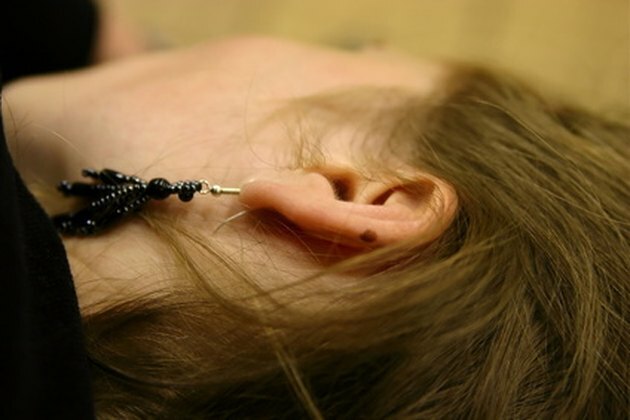 Ear wax serves an important purpose by trapping debris before it can get further into your ear. But when you accumulate too much ear wax, it can cause discomfort and trouble hearing. With a little vinegar and water, you can easily clean out your ears and remove excess wax. Mix together one part white vinegar with one part water and two parts 3% hydrogen peroxide. Heat the solution until just warm, but not hot. Draw the solution up into a bulb syringe. Tilt your head to the side and gently dispense the warm solution into your ear. Keep a clean cloth handy to catch any residual moisture. Lie down, with the affected ear facing up, for 3 to 5 minutes. Tilt your head to the side over the sink to allow the solution to drain out again, using the cloth to catch any excess that drips into areas where you don't want it. Repeat the process on the other side to make sure that both ears get cleaned out. Rinse your ears with warm running water. This is easily accomplished in the shower. The solution will have helped to loosen the wax and the water will help to rinse it away. If you have a history of ear infections or a ruptured ear drum, do not attempt to clean your ears on your own. Consult with your doctor to get help.